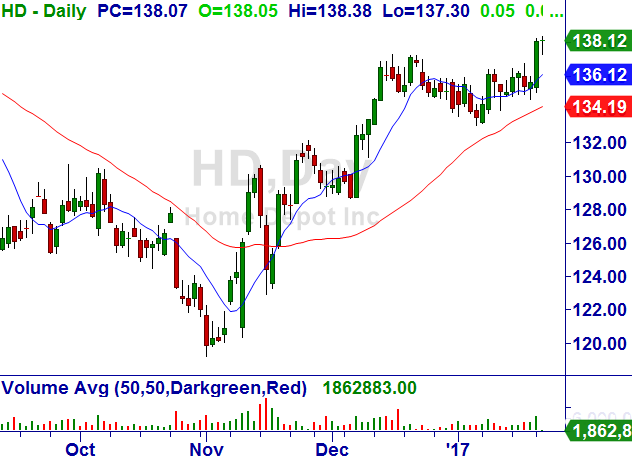 Below is a daily chart of The Home Depot, Inc. (HD), $138.12. Trade: Over $138.50, we recommend two bullish trades: (1) buy 10 Feb (24 DTE) $137 calls (currently $6.70/share); and (b) selling 10 Feb $133/127 bull put spread (24 DTE) at midpoint (currently .61/share). On the long call, we will look to leg into a bull diagonal (i.e., shorting weekly OTM calls against the long Feb call) over time. Strategy: Bullish Wide Range Bar (+WRB) breakout yesterday from bullish consolidation on daily and weekly charts. Max Gain: Unlimited on long call; credit received on bull put spread. Max Loss: Debit on long call; spread width less credit received on put spread.